FDI in India has been quite controversial issue as far as India's economic policy is concerned. The FDI Limits as decided by the union government has been quite interesting. While Single Brand Retail Outlet, Tourism, Pharma & Telecom sector can have 100% FDI, Govt. has been quite cautious to allow only 26% FDI Limit for Defence Sector. 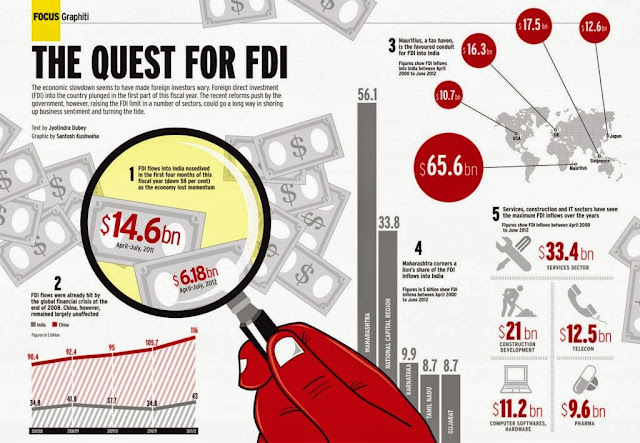 The awesome infographics will help in understanding the FDI Inflows in India and Global FDI scenario.